Well, we all know that retro everything is making a comeback at the moment and to be honest, you’d have thought we’d be sick of it by now. However, there is a new London band called Chadwick Station whose new EP is quite possibly one of the greatest retro-inspired things you’ll ever hear. It’s not often I come across an unsigned band who I would genuinely describe as my new favourite band but I think these guys might just be it. Although they’re from London, they’re now living in Nashville where a producer is using their music for an upcoming film called An Inconsistent Truth. 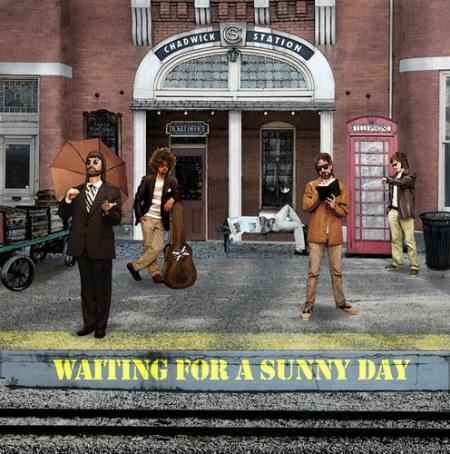 Waiting For A Sunny Day is their debut EP and as many other reviewers before me have stated, it’s amazing. One fan even stated “The Beatles are back!”. A pretty massive statement? Yes but I’m excited to say that I agree! Retaining a sunny disposition throughout, Chadwick Station begin things with High And Low which has a singing riff, a pop quality to the upbeat melody and that lovely retro rock sound. Comparisons to The Beatles are already flying through my head and it’s clear that big things await these guys. Catchy doesn’t cover it! Leaving It All Up To You has a great chorus set to a jazzy showcase of a backing track. Very 60s, very upbeat and a little bit camp, this is how to emulate the great rock stars of the past. A touch of modern indie is detected in the vocals and this is what keeps it fresh. It isn’t getting stuck anywhere, it’s clearly from the past but belongs in the present. Startin’ Tomorrow has the first touch of the band’s influences in their new American home. A summer Americana vibe is strewn all over this track and with a bit of a pop-punk riff merged with the indie vocals, it’s a great example of Brit-meets-Yank. In fact, I’d even venture to say that Startin’ Tomorrow wouldn’t look out of place on Fun’s next album. It has that same level of quirkiness and… well, fun that the New York trio have. Perhaps the most downbeat track on the album, Before Time Slipped Away still fits in with the positive retro theme. It’s the kind of track they could have played during the prom scene in Grease with its beautiful swaying rhythm and is definitely a lost-love track. Despite being dramatic and depressing, Chadwick Station still manage to keep up the happy and it continues right until the end of the record. Closing on the title track leaves the listener with nothing but great things to take away with them. It seems that the band have brought the sunny day they’re waiting for with them, according to the Californian vibe that surrounds this acoustic-led track. Another catchy melody spells great success for their debut EP and I, for one, cannot wait to hear more. Chadwick Station are one of those bands that will make a great impression of British music overseas. They’re fun, carefree and so exciting -let’s have some more please! 23 year old music blogger and freelance writer from South East London. Marketing/Social Media Executive and Aberystwyth Uni graduate. Waiting for my big break in journalism.